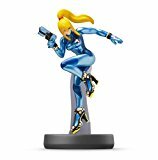 Zero Suit Samus Amiibo (Super ..
Nintendo Zero Suit Samus - Ami.. Product weight is 0.15 lbs. Very fun to have an AI that you train to be better, and once they get to a certain level where they start beating you you almost feel proud like "My pupil has learned and surpassed the master, go on to do great things my child!"